Depression is an epidemic sweeping through society. One patient in three seeking medical help is plagued with depression. Dr. Nedley recognized this unfortunate trend in his patients committed to finding solutions to the problems that cause depression rather than just anesthetizing the symptoms with medication. 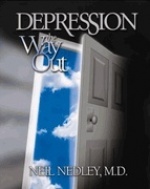 Through Dr. Nedleys ongoing study of the latest scientific research related to diseases of the mind, combined with years of clinical experience, he compiled his remarkable findings in Depression: the Way Out. In this outstanding book, he provides an insightful and in-depth comprehension of the body's physical, mental and spiritual functions. The information in this book is sure to bring understanding and hope to those in the grip of this dark disease.